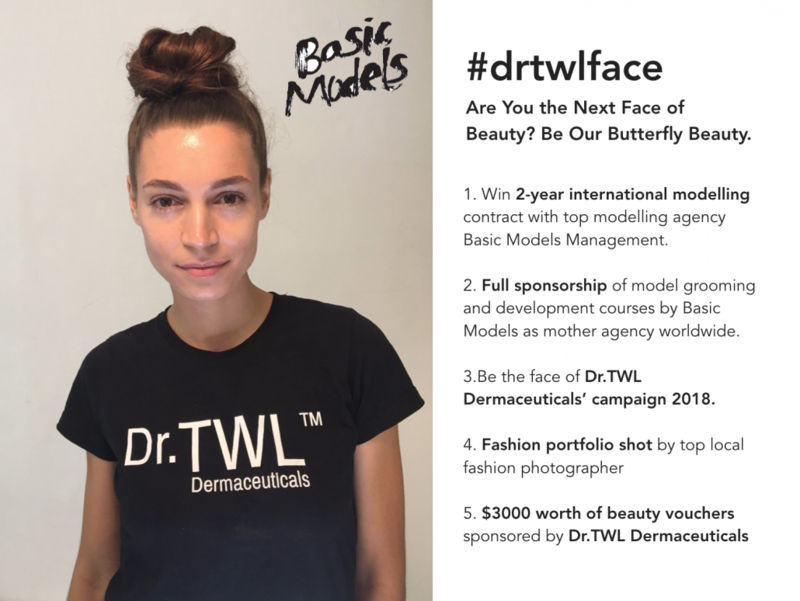 Dr.TWL Dermaceuticals will partner with Basic Models Management to offer the winner of its Instagram-based global model search, #drtwlface, a two-year international modeling contract, as well as $3,000 worth of beauty vouchers. Singapore, June 8, 2017 – Dr.TWL Dermaceuticals (www.drtwlderma.com) announced today that it will partner with Singapore-based Basic Models Management, who represents top Singapore models like Fiona Fussi and Aimee Cheng-Bradshaw in its search for #drtwlface, the global face of the brand. To participate in the competition, contestants are required to snap a picture of themselves in full colour, follow @drtwlderma on Instagram, and post the picture along with the hashtags #butterflybeauty, #drtwlbutterfly and #drtwlface. Ten finalists will ultimately take part in the “Strut The Runway Launch” event in September 2017. The top prize up for grabs includes a 2-year international modeling contract with Basic Models Management, full sponsorship of model grooming and development courses, $3,000 worth of beauty vouchers, in addition to a fashion portfolio to kick start their modeling career by a top local fashion photographer. The winner of the contest will be chosen as the face of Dr.TWL Dermaceuticals’ 2018 campaign. #drtwlface was launched earlier this month, coinciding with the launch of Dr.TWL Dermaceutials’ dermatologist-tested and formulated cosmeceutical label. More details on #drtwlface can be found on www.drtwlderma.com/drtwlface/. (1) reference Dr.TWL Dermaceuticals as the source and include a hyperlink to the original release on the company website; (2) do not modify any press release wording; and (3) do not modify or add hyperlinks, including but not limited to ad links, within the press release. Dr.TWL Dermaceuticals (www.drtwlderma.com) is a cosmeceutical range that combines the expertise of a Singapore dermatologist together with a pharmaceutical engineer and is developed in a research laboratory, with manufacturing standards certified by the Euro ISO 22716, a standard that complies with the European regulation for cosmetics for the European market. For more information, please contact Justin Teo at +65 9635 6859 or contact@drtwlderma.com. Dr.TWL Dermaceuticals presents The Art of Fencing & Precision Skincare. Dermatologist-tested and formulated. It doesn’t matter who you are, what matters is, what you are made of. Featuring former Olympian Simon Senft, as Coach, with his student. Singapore, June 1, 2017 – Dr.TWL Dermaceuticals (www.drtwlderma.com) today announced its entry into the luxury skincare market, featuring the premier homegrown cosmeceutical label that is dermatologist-tested and formulated, a first on the Singapore beauty scene. Its launch boasts a minimalist approach to one’s skincare regimen – “7-Steps to Perfection”, with evidence-based active cosmeceutical ingredients for restoring skin health, rejuvenation and anti-aging. Their mission is to make dermatologist-grade cosmeceuticals accessible to all, for those who have never visited their dermatologist’s office. Their key ingredient is their signature, LARECEA™ Extract, developed in a biotechnology laboratory. It consists of a potent combination of bioactive ingredients found to occur naturally in brassica oleracea (cruciferous family plants), suspended in a unique formula combined with potent regenerative amino acids, infused in every one of their products. Brassica Oleracea extract (think family of kale, broccoli and cauliflower) has been shown in research to increase rates of collagen production, hence helping in anti-ageing, as well as being UV-protective. At the helm of the line is company director Mr. Teo Zhi Liang, a pharmaceutical engineer. The line is formulated and tested by his sister Dr Teo Wan Lin, an accredited dermatologist in Singapore. The duo work directly with a top chemist in a certified biotechnology laboratory, with production processes conforming to manufacturing standards certified by the Euro ISO 22716. “I started this line at first purely for my patients, where I practise at TWL Specialist Skin & Laser Centre www.twlskin.com as a dermatologist. Zhi Liang, with his pharmaceutical background helped to bring quality-formulated, dermatologist-tested and formulated cosmeceutical skincare to the masses, which we are showcasing on an e-commerce platform to reach the global market for the first time,” said Singaporean dermatologist Dr. Teo Wan Lin. The global launch video was an artistic collaboration with fencing coach Simon Senft, a German Olympian and former European champion, as well as an international creative team. 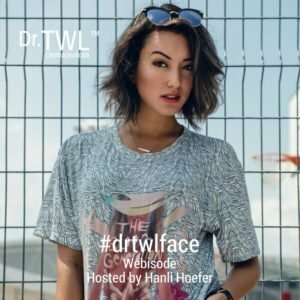 The website launch coincides with their first campaign #drtwlface, an instagram-based global model search for the face of the brand @drtwlderma https://www.instagram.com/drtwlderma/. More information can be found at http://drtwlderma.com/drtwlface/#. For more information, please contact Justin Teo at +65 9635 6859.